It's official: Microsoft’s search for a new CEO is over. Following recent speculations , the software giant is indeed appointing Satya Nadella as its new CEO to replace Steve Ballmer. The 46-year-old Nadella will take over immediately, allowing Ballmer to retire early. Nadella had been one of a number of candidates that Microsoft is believed to have interviewed for the role; the company originally said it was pushing to name its Ballmer successor before the end of last year . Despite the fact that the search extended into 2014 , the timing of the CEO announcement is important as it places Nadella in charge ahead of the closure of Microsoft’s Nokia deal and the company's ongoing reorganization. As Nadella takes over as CEO co-founder Bill Gates steps down as chairman today; his new official title is founder and technology advisor. "I'm thrilled that Satya has asked me to step up, substantially increasing my time at the company," says Gates in a video commenting on Nadella's new position. "I'll have over a third of my time available to meet with product groups and it'll be fun to define this next round of products working together." In a similar video, former CEO Steve Ballmer also congratulates Nadella on his new role: "I have absolutely no doubt Microsoft is in good hands, with Satya and the rest of the senior leadership team that is in place," says Ballmer. "We have so many strong leaders … the future of Microsoft is incredibly bright." It's clear that Microsoft's former CEOs back Nadella, and he also has the unanimous support of the board. 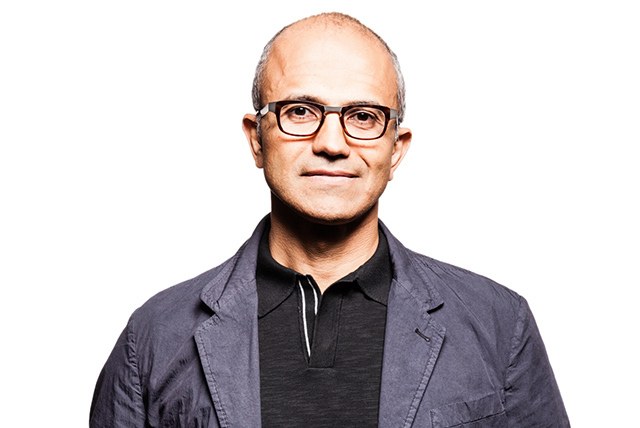 Nadella is a Microsoft veteran, having joined the company over 20 years ago.Born in India in 1969, Nadella studied Electrical Engineering at the Mangalore University before moving to the US to study computer science at the University of Wisconsin-Milwaukee. He originally worked at Microsoft rival Sun Microsystems before heading to Redmond to work on research for Microsoft’s online services division. He has held a number of roles inside the company: he's worked in the company’s business division on Office and even has some experience building the Bing search engine. Most importantly, however, he has been instrumental in transforming Microsoft’s cloud business and has previously led its server and tools business. Nadella’s work on Microsoft’s server and tools business helped boost the division’s profitability and smoothed its transition from traditional client-server computing to cloud infrastructure like Windows Azure. Recently, Nadella has been focused on Microsoft’s cloud businesses, pushing the company’s underlying infrastructure and services into products like Bing, SkyDrive, Xbox Live, and Skype. While Nadella has little experience running consumer-facing businesses like Xbox or Skype, he does have a deep understanding and knowledge of the computing and engineering required to develop and build services and applications that are used by millions. Given Microsoft’s "devices and services" push, he’s clearly well positioned to help steer the company in one particular direction. While Nadella has made a name for himself inside Microsoft as an intelligent and charismatic leader over the years, he’s not a household name to consumers, and even to most businesses. He has surged through the ranks with technical expertise and a focus on enterprise, but has little involvement in Microsoft’s devices and mobile future. His appointment will come as a surprise to those who expected former Nokia CEO Stephen Elop to take over from Ballmer. While Elop has run a publicly traded company, Nadella lacks this key experience. Elop will still rejoin Microsoft shortly to lead an expanded devices team focused on Surface, Windows Phones, and Xbox. Microsoft’s core strength currently relies on enterprises and businesses purchasing licenses or using software and services that the company develops.While Windows is struggling thanks to a decline in PC shipments, Microsoft’s enterprise, Office software, and services are continuing to bring in impressive revenues for the company. Nadella compliments this strength perfectly, but he will now need to prove he can complete Microsoft’s vision for devices and its ongoing mobile push.